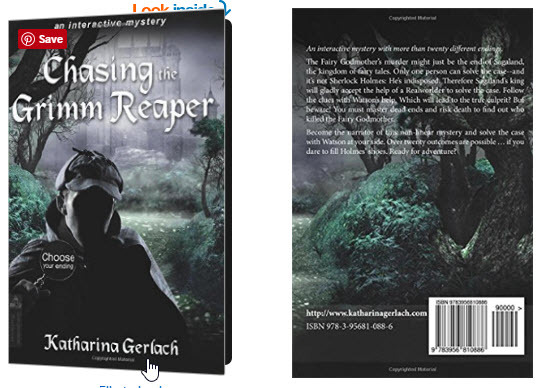 Chasing the Grimm Reaper pits the reader against the unknown killer of the Fairy Godmother. Yes, the Fairy Godmother. But don’t worry: You have the aid of Sherlock Holmes and Dr. Watson in the weird and wonderful world known as Sagaland, where fairy tale denizens accept the existence of Real Worlders about as much as smarter children and adults accept the reality of fairy tales. When I first checked it out — which I did because I love fairy tales, Sherlock Holmes and Katharina Gerlach’s fairy-tale-themed stories — I did not have high hopes, put off by the words, “Choose Your Own Ending”. I have always disliked those second-person, choose-your-own-ending stories that became briefly popular in the 1970s, so I was surprised to discover that Chasing the Grimm Reaper actually isn’t one. Instead, it’s a non-linear, first-person story that feels more like one of the old text adventure games — and more to the point, like a story. It was fun to try Katharina Gerlach’s story different ways, and the end result was that you really did feel like you steered the story to your favorite outcome. Some choices led to catastrophe (if not for you, for a specific character); some pitched you right out of the game — there; I called it a ‘game’— and there was one ending I really liked. Chasing the Grimm Reaper was truly fun for all ages. The internal links worked beautifully even without WiFi, and whiled away a perfect hour sitting, apparently abandoned and forgotten, in the parking lot of Home Depot. You can find both a print version and the Kindle version at Amazon.com.